Wisenet Learning Relationship Management (LRM) application is a government certified Student Management System in Australia, New Zealand and Singapore. We are AVETMISS, SDR and NZQA compliant. As an LRM Admin your role will look at efficiently administering main sections in Wisenet LRM to meet your business and compliance requirements. The flow chart below is a guide on where to start and what to set up and maintain. The basics for all or some of the sections below may have already been set up in Wisenet by your organisation during the Onboarding process. These are good to know features if you are ever required to administer any of these sections in Wisenet LRM. Hover on a section of the diagram below to learn more or continue reading further below. Locations are used in Wisenet to tag delivery locations for each Course Offer. It is mandatory to identify locations for State and Federal Reporting. We generally recommend that a new location is added for each postcode. You must set up a Location for all delivery that you do. Relevant to your Organisation and the country you are delivering training in, understand your compliance requirements by discovering a variety of compliance approaches that may underpin your organisation’s essential regulatory requirements, compliance and quality standards and guidelines. The basics for all or some of the sections below may have already been set up in Wisenet by your organisation during the Onboarding process. As LRM Admin you are required to administer these sections in Wisenet LRM. We recommend having the LRM opened side to side with the instructions you are about to follow for ease of use. Dashboards let you see information in real time. Different users will have different widgets depending on their security level. As LRM Admin you will be able to see Analytics and All Tasks. A Course Offer is the organisation’s unique delivery for a Course that Learners are enrolled in. An organisation can have multiple Course Offers for the same Course. Course Offers are made up of Unit Offers that a Learner needs to study for the duration of their qualification. It is important that the Course Offer is created accurately to avoid errors with enrolments and for correct reporting. A Learner is the person who is completing training. They enrol into Course Offers and Unit Offers where progression is tracked. There are different types of Learners therefore different details are required to be collected depending on the type of Learner. Enrolment is the process of recording a Learner’s registration into a Course Offer. Before a Learner can enrol into a Course Offer it is critical that the Course Offers, Unit Offers and Learners are set up to suit your delivery method. uReport is an easy way to generate documents such as Credentials, Letters of Offer, Welcome Letters, CAN’s and Training Plan and other General templates. Custom templates is easy to create and update. uReports are generated per Course Enrolment and can be ran individually for a Learner, in bulk for multiple Learners in a course offer or automatically with Learncycles. You can then email your personalised uReport document to each Learner or other recipients as an attachment. Depending on your funding and reporting requirement, generating Exports is critical to the ongoing management of your organisation. Reports allow for extraction of data from Wisenet and we have hundreds of Reports to choose from. Before generating a Report it is important to reflect on the purpose of the report as you can achieve many different outcomes. Analyse what is the key data you require an in what type of format you require it. Then find the right report to generate. The basics for all or some of the sections below may have already been set up in Wisenet by your organisation during the Onboarding process. As LRM Admin you may be required to administer these sections in Wisenet LRM. Workplaces can be used for tracking details for any type of employment or training based organisation. Logbook is where all your file notes, tasks, messages, documents and uReports are recorded and saved. It can be accessed in every section of Wisenet by simply clicking on Logbook from the Left Navigation Bar. The Learner App allows learners to log into their own personalised account. The application works on any internet browser enabled device using a browser instead of downloading a mobile application. 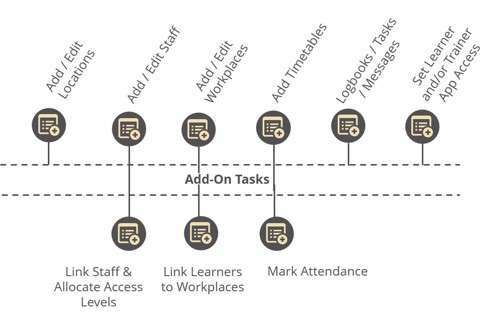 Get things done quickly by using Wisenet Bulk Update feature and with more accuracy by automating your processes with Wisenet Learncycle Workflows. These will allow you to take unique control over your data, administration, and reports. Bulk Updates can be performed in various areas of Wisenet saving you time and reducing errors. Learncycle allows you to automatically update records and create Tasks, Documents and Messages which is triggered by key events in the Learner’s Lifecycle. Use your custom templates, or our standard ones, to send personalised messages and documents on your schedule.